It was the inaugural running of The Berghaus Trail Chase on the weekend just past, 16/17th August. 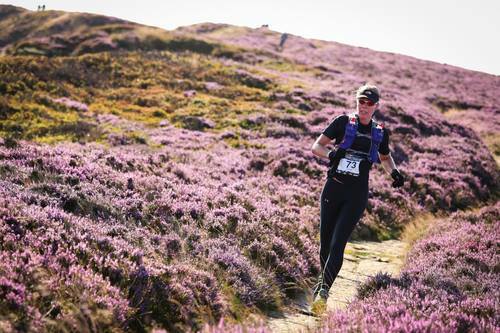 Set in the stunning North York Moors, one of the largest expanses of heather moorland in the UK, the landscape is wild, windswept and wonderful and is a superb location for a run. 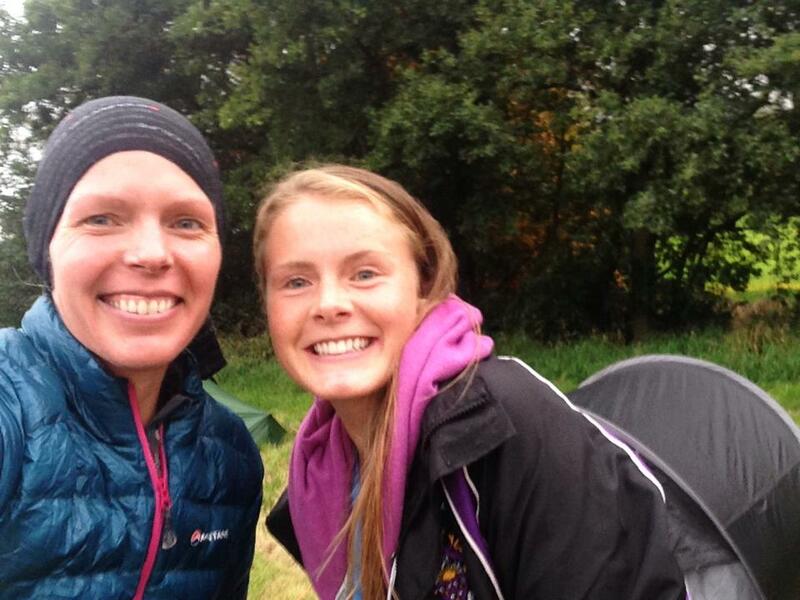 I’d arranged to meet up with Marina, a friend I’d made at KAEM last year, who was also running as part of a training plan I’d put together for her in preparation for our return to the South African desert later this year. I chose the black course as I wanted to test myself and I always think the further I have to travel to a race the tougher/longer it had better be to get my value for money! It was an odd starting time, with registration finishing by 12:30pm, on a bus for 1pm and due to start for 2pm. The bus journey was long and we didn’t actually get started until 2:15pm, and with having been up since 6:30 I felt knackered before I started. I hadn’t been training in particular for this race and my week before was pretty rubbish in terms of diet, training and sleep and I felt this effect me on the first day in a negative way, slow and sluggish my body just wasn’t responding how it should or how I wanted it to. Why must I always learn things the hard way, and never completely learn from it? The route wasn’t what I expected, I thought the clue would be in the name ‘Trail Chase’, but all I found was either bitumen or fells for the most part which really frustrated me. I’m not a fell runner, I don’t like it and frankly don’t want to learn to like it. I was 1st or 2nd lady for the period before the fells, then they all came past me, we’d hit some road and go back past a few of the ladies, but they’d quickly fly past me on the fells again! The wind was super strong and this made it quite cold, I was regretting donning my wee Lululemon running skort instead of long tights for both the cold and the overgrown ferns that were shredding my legs. There were no check points along the route on both days so I kept my water consumption pretty low and fuelled on a couple of tasty Torq gels to keep my energy levels up. I caught up with Philip Kelly, or he caught up with me…..😉 about 3 miles to the finish. We both seemed to be having the same day of it so we stuck together to the finish. It was good to talk and I felt in a much better mood by the time I crossed the line in 20th position in 4hrs 25. To ensure a speedy recovery my first point of call was to make up my ‘For Goodness Shakes‘ recovery shake and get this into me which I believe is key to my good recovery technique. This along with stretching and getting my Compressport recovery quad and calf guards on, which I also slept in. Accommodation was camping for the night so I swung the pop up tent out of the bag & ‘voila’ our house was made, for Marina and I that is, a cozy little number for two. The camp site was in a field next to a hall where dinner was served and toilets were available, no showers unfortunately so a bit of a wet wipe and clean clothes and I felt as good as new. I’m not much of a camper, I prefer the luxuries of sleeping under 5 stars 😉 so the night was restless, but managed to get some sleep listening to the rain on our tent, hoping it was waterproof, wondering what tomorrow would bring. I awoke with my legs feeling pretty good and ready to rock n roll. Today was the chase down, so we all started the race in order of how we finished. If you passed someone you knew you’d made up a place. This definitely sparked my competitive streak and I was keen to get started. Today was good runnable trails and I was both in my element, flying along and pushing fast to catch the other runners. I felt my hill training paying off as I passed people who were walking up hills and I have to admit I took great pleasure is passing 2 ladies on one of the big downhills that had passed me twice the day before in my horrible attempt at fell running, it filled me with even more confidence and I put the hammer down. Only half a marathon distance to get through so no reason to take it easy. It was a brilliant day, I loved every minute of it, flying over the trails and taking in some great views. It was great running with Philip too, we seemed to be well matched in terms of pace and seemed to push each other on. It’s always great when you find you click with another runner. A great day out running, I made up 5 places and made it back into 15th position, so job well done. A good training weekend under the belt, and I certainly loved the concept of the chase day so I am sure this won’t be the one and only time this event is run. Thanks Berghaus, a fun weekend of running and I’ve got a great shirt in my goody bag! OOO I was tempted, I’ll have to do it next year!